Let's chat about the Agatha nominees! Wow - WHAT a stellar group! I have no idea why I feel like such a proud mommy when I see so many names I know, and so many people dear to my heart, but it truly does make me enormously proud. What a kick to know so many delightfully talented people. And, of course - how bout a standing ovation and a few rounds of heartfelt applause for Reds Hank and Rhys, who have three nominations between them. I am smitten with pop-up books. I have, for many years, resisted the urge to start collecting them, but it's hard. And I know I'm going to, some day, just toss off those restraints and give in. I already have a little bit of a start. My friend Cat gave me this adorable little Lulu Guinness book, Put on Your Pearls, Girls! Have you seen it? I just love it. It speaks loudly to the "girly girl" in me. I also love my pop-up version of Alice's Adventures in Wonderland, as any "Alice Fanatic," such as myself, would. Harley loves Alice too, so . . .
What mystery loving woman doesn't have a soft spot for Nancy?! She's the one who got so many started in our love of mystery novels, after all. And by golly, she deserves her very own pop-up book, right?! Well, of course she does, and it is wonderful! Besides the pop-ups, there's a bunch of other little secret things - envelopes with "clues," letters, just neat fun really cool stuff. And this leads to a confession. And, of course, I blame Lee Ann. Besides my delightful Nancy Drew pop-up book, she also gave me a gift card. I have wanted this one for awhile. Those are the only pop-up books I really need. Who cares if the "King of Pop-Ups," Robert Subada, has done a very tempting Peter Pan pop-up book? Who care if there's a Dr. Seuss pop-up book? Or one about Edgar Allan Poe? Or "The Wizard of Oz?" EEK!!!!!! "The Wizard of Oz!" Or dinosaurs, dragons, and farms? Or cities, and ocean, and super heroes? OR, that there are wonderful books about making your own wonderful pop-up books?! How 'bout you, Reds, are there any pop-up book collectors out there? Don't you love 'em?! And if pop-up books aren't your weakness, what type books IS? Surely, there's at least one . . .
Congratulations to Hank and Rhys for their Agatha award nominations! Pop-up books . . . oh, I do love them, and so do children. That means I have a great many of them among my huge collection of children's books . . . .
Congratulations to Hank and Rhys! Go, Reds! Oh, Kaye! My long time friend loved pop-up books, as did my nieces. We would hunt them up and buy for the nieces and I'd buy for her. They are such fun, but never really MY thing. Well illustrated children's books, now that's different! I bought them for the nieces AND for myself. Joan - I'd like to hear more about your collection. Children's books are quite precious and so many are works are art. stitchkat - how fun to have a friend to go book hunting with! Like you, I admire well illustrated books. I think there should be more illustrated adult books. I once had a Charles and Diana pop-up book, which I gave to a friend who collected royal books. While they were still a couple. I adore pop-up books. When my nine nephews were little, I gleefully searched out pop-up books for them. But to collect for myself--no. I don't have much restraint when it comes to beautiful books--so collecting would have quickly become unmanageable! Congratulations to Rhys and Hank--we all know how talented, hardworking, and deserving our Reds are!!! Congratulations to Hank and Rhys! Did you know there is an actual pop-up book called THE POP-UP BOOK OF PHOBIAS? Whose brilliant idea was that? Needles, flying, snakes, a big microphone with a crowd staring at you, and yes, a clown ... all pop out at you. There's a youtube video of it if you type in the book title. I really like that Nancy Drew one but more for the "multimedia" effect of so much to look at on each of the pages. Susan - A Charles and Diana pop-up book! Was there a pop-up of Diana in her wedding gown?? I remember that wedding like it was just a day or two ago. FChurch - Beautiful books and restraint. I agree - the two just do not go together for me either! PK - I've seen that phobia book, mentioned it here in my piece, and I think it's pretty awful, truth be told. First, the most important note - Congratulations to Hank & Rhys! My favorite awards, the Agathas. I enjoy looking at a pop-up book, but they don't catch my attention. Books about books & bookstores. Three of my favorite books last year were about books and bookstores. I'll always give one a chance. And, I'll always give Oh, Kaye! a chance to see what you're talking about. Hugs, Kaye. And yes, thank you! I am swooning with delight--TRUTH BE TOLD was nominated for BEst Contemporary novel, and WRITES OF PASSAGE for best nonfiction. Wow wow wow. SO honored and grateful! And I wonder how they even design them? I will join in with your love of books about bookstores, which is why we both loved Fikry, and Charing Cross Road, I guess. Have you ever done a blog about books about bookstores? Hank! There IS a Game of Thrones pop-up book!!! Do check it out. And then come play Nancy Drew with me (I just finished major housecleaning, so come quickly before it's back to its normal state!). There are several books about how to make your own pop-up book, and I've looked at them, but I think you have to have some engineering aptitude, of which I have none. Kaye, you're right; many picture books are absolutely spectacular. Having taught Little Ones for many years, I have a huge collection of these picture books [and big books, which are truly wonderful when you're reading to a larger group of children]. One of my treasures is a copy of Isaac Asimov's "The Best New Thing," now long out of print. As far as pop-up books are concerned, the children loved "Race to the Finish," based on Disney's "Cars" and Dorling Kindersley's "On Safari" with the animals popping out of each page. Since I also did a extensive space program each year [complete with moon rocks], many of my pop-up books are space-related. My favorite is the absolutely amazing "Journey to the Moon" from Simon and Schuster Children's Publishing Division. The pop-ups are simply stunning. And I would be SO tempted by The Little Prince pop-up book if I could find one in French. Joan - You have me curious about Isaac Asimov's "The Best New Thing." I'd like to see what it's all about. FChurch - isn't that a funny picture of Harley?! 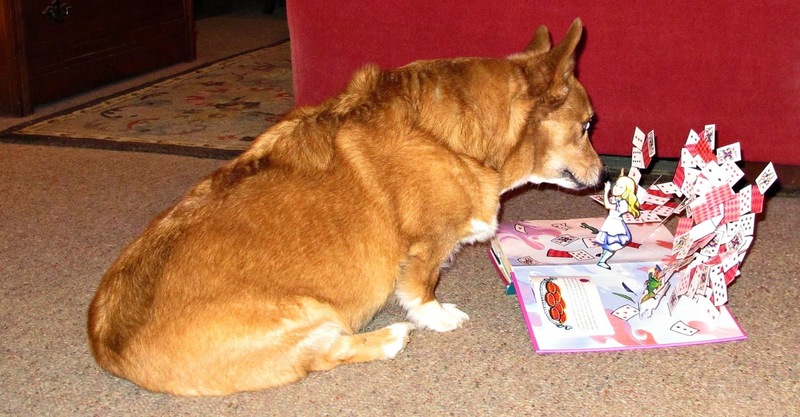 I love when our furbabies show an interest in what we're reading, don't you? If I see a Little Prince pop-up in French, I'll give you a shout. The Best New Thing [World Publishing Company, 1971]; illustrated by Symeon Shimin [who has signed my copy] . . . .
Two children, Rada and Jonny, who have grown up on a world in space with little gravity prepare for a trip to Earth with their parents. The best new thing, which the children plan to try as soon as they reach Earth, is something they could never do on their little world in space. They run to the top of a little hill, throw themselves down, and roll down grassy slope with Earth's gravity holding them to the ground. Excited, they jump up and run to the top of the hill to try it again. When books and authors you love are honored, it feels personal, and I am so happy for Rhys and Hank in their Agatha nominations. Congratulations, you amazing storytellers. And, there is the short story category in which one of our Reds Regulars (although Irregulars sounds more daring) has been honored. Edith Maxwell has been nominated for her short story, “Just Desserts for Johnny”. So to all of you, we celebrate with you. Factory. I think I have a couple more, but I can't think of what they are right now. So, Kaye, you have encouraged me to loosen the restraints on my pop-up book buying. I'm not sure if I should thank you, as I currently am trying to decide how best to weed out some books. But, the topic was delightful today, and it's always good to talk about the joy of book owning. Oh, Kathy, I'm so glad you enjoyed this. What's more fun that talking about books with friends who feel the same pull of the printed word? My great-niece gave me pop-up Grimm's tales last Christmas . . . and now I'm remembering the books my mom bought when the greats were small, something with bugs and other icky stuff in a sandwich. They loved them! Art classes at FHN made pop up cards . . . challenging, but fun! My language arts classroom was near the art rooms, so I got to watch their progress in many media and sometimes use some of their work to tie in with literature or even grammar lessons. Inter-disciplinary learning is the best! Storytellermary - I have not seen the pop-up Grimm's - I would love that! I also love "Inter-disciplinary learning is the best." I'm wanting a Harry Potter pop-up but have not run across one - surely there will be one! I really did leave this page to go look up the Nancy Drew book. Here's what I found. If you want to order it from Amazon, you can only get a used copy. Barnes & Noble has it new for $19.10. Link is http://www.barnesandnoble.com/w/lost-files-of-nancy-drew-carolyn-keene/1008280310?ean=9780448446479 Kaye, this one is going to be a birthday present to myself. Thanks! Kathy Reel - Treating yourself to a book is the perfect way to celebrate your birthday! Dear Kaye - WHO KNEW! We have quite a collection of pop-up books too! Including a few that are quite old. But I really really want a pop-up Nancy Drew. how cool is that?? Thelma - You adorable woman - those are all photos I took of the pop-up books I have. Sending a hug! I love pop-up books too. I get to catalog them for Special Collections every once in a while at work. There are some really cool pop-up books out there folks.